So what’s better? A teacher who waits in the wings till students need them, or one who “softly and silently vanishes away” when they are no longer needed? Or, rather, which is better when? 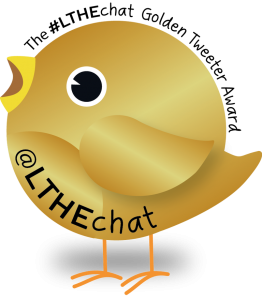 This entry was posted in #MoocMooc, Learning, Online learning, Teaching and tagged Buddha, learning, scaffolding, Vygotsky. Bookmark the permalink. I have done this by designing in Moodle for my f2f class. Someone on #moocmooc recently said we should reserve class time for face to face interaction. 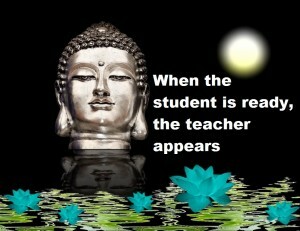 There is some truth to this, however, by channeling my f2f class through an LMS it was easier for me to disappear. For a good while I hovered, chatting to students, ferreting out problems, explaining things, encouraging students, finding out why people were not working, finding out why they were working. I also learned a lot about how they worked in the LMS, how to write instructions, how to design activity that they understood, how much choice they would tolerate and so on. As time went by I was able to come to class late and find them already working. I was now the bored one in the room, looking out the window or disrupting them with chat. These were three hour classes and I would frequently leave, go to my office or to the canteen, coming back in 15 or 20 minutes. At one point I had to leave the country for a week but my class still met on time and did their work. The LMS enabled me to focus on their learning and not to disrupt that with my presence, not to stand and demand their attention, not be in direct control of them at all times. It was a composition class – Academic research writing – and they were doing collaborative writing on GoogleDocs, writing about whatever they wanted. In the end, I was satisfied that most could do without me. That was my goal. So, with any group of people I think we need to stay in the wings and slowly vanish. When we leave and they don’t notice that we’re gone, that is when we’ve done our jobs well. Yup, I could tell from your tweets that you are able to make yourself vanish as appropriate. I try to do something similar, with the very limited scope I have. I tutor F2F level 1 seminars, and my students are getting used to working in groups, discussing concepts with each other and helping each other out. Yesterday they laughed when I told them I was bored coz none of them needed me. I think the instructor involvement needs to vary, depending on the student needs. In PBL, we often use the term “facilitator” rather than “teacher.” One implementation model I particularly like is a lot of student-driven work, with opportunities for “workshops” on particular topics that students need help with. As facilitators, we also need to be open with “I don’t know, let’s find out,” modeling the fact we should all be #lifelonglearners. Working with carpentry apprentices there comes a time when you have to step out onto a scaffold THEY built without your supervision. It’s an obligation to them that they be allowed a functional autonomy. And also to others who might work with them. I wouldn’t want people around me clinging to instructions–fly away little birds. Was in an online class where the instructor announced she was quitting in week two of (I think) twelve. She then went off line. We had been instructed to build blogs to post our work to is but we hacked back into Moodle and worked there, finishing the course without her. By the time the University found out she was gone we were almost done and they allowed us to pass. I think we worked harder creating our own content and discussing it among ourselves. The course was an intro to OER and it was kind of appropriate to let us make our own class. 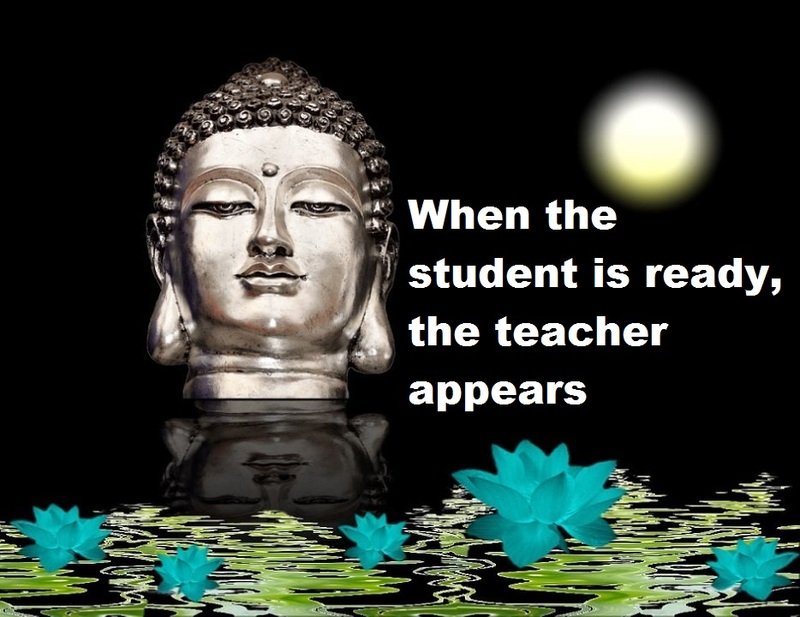 Had the Buddha loaded his content onto the LMS we would have a RECORD of this saying:-) My sense is Buddha meant a well taught student will naturally claim the role of teacher for themselves. What goes on in that time when the student isn’t ready? I have accomplished this with high school students as well. I worked with students to design a learning plan and then, off they went. They would come into class, sit at a computer or pull out whatever else they needed to do their learning (most days). My best role was to pose questions when they got stuck. Giving up control was the only way for them to have agency and develop autonomy as they worked on developing their curiosity and learning skills. Fascinating to follow this discussion and try to transpose some of the ideas to my work with primary age children. The most exciting moments in string game instruction for me come when enough students have learned a figure–roughly 5 or 6 out of 20–that they get designated as “helper teachers,” that they can begin teaching each other, and soon I am able to step entirely back and they will rhizomatically network to find the dyads and triads where they can best learn. I just did a day at a school I haven’t taught at often, where I had seven classes for forty minutes each. In only one of the seven did this happen, and it was the class where more students than in any of the other classes had some prior experience with string figures.